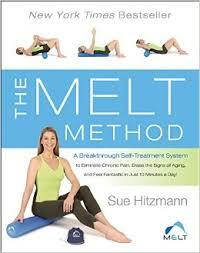 In five weeks, you’ll learn all of the moves in the book “The MELT Method”. Learn how to identify where you have stuck stress in your body, use the MELT Hand & Foot treatment, improve your Body Sense, active your own core strength and stability, use the MELT Soft Body Roller to rehydrate the tissues of your body for greater mobility and ease of motion; safely and effectively decompress your neck and low back. These techniques will make your body feel better and keep you active and pain-free for a lifetime. You will learn how to put it all together so you can maintain a MELT practice at home. This class is best for participants who can get on and off the floor, lie on their backs for short periods of time, and lie on the roller. If your pain prevents you from doing this, consider booking a private session where Susan can make modifications to keep you comfortable and she can create a MELT map (plan) specifically to suit your issues and needs. MELT balls and rollers will be supplied for in-class use. MELT equipment is available to purchase for continuing the MELT Method at home. Dress comfortable and please bring your water bottle to class. Space is limited. To register for class, please call Susan at 315-560-2727315-560-2727.